BOOM! Studios is excited to announce new variant covers by industry legends Frank Quitely (All-Star Superman) and John Cassaday (Astonishing X-Men) for KLAUS AND THE CRISIS IN XMASVILLE in December. 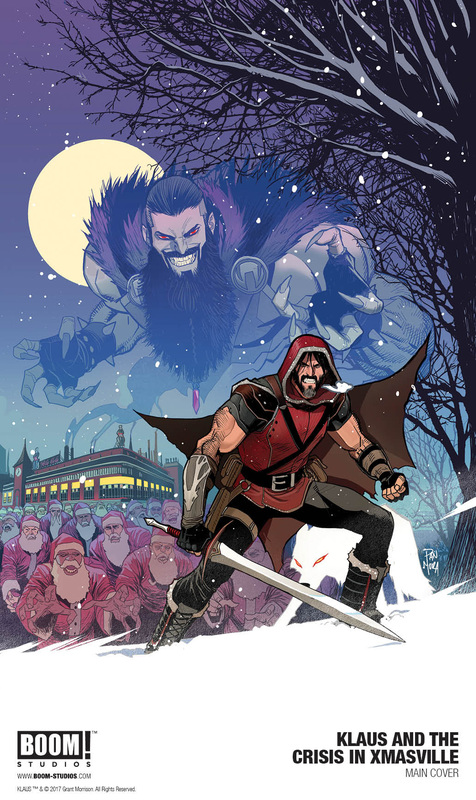 Eisner Award-winning writer Grant Morrison (Batman) and Eisner Award-nominated artist Dan Mora (Saban’s Go Go Power Rangers) return with an all-new chapter of their acclaimed reimagining of the Santa Claus origin story in a special oversized one-shot. 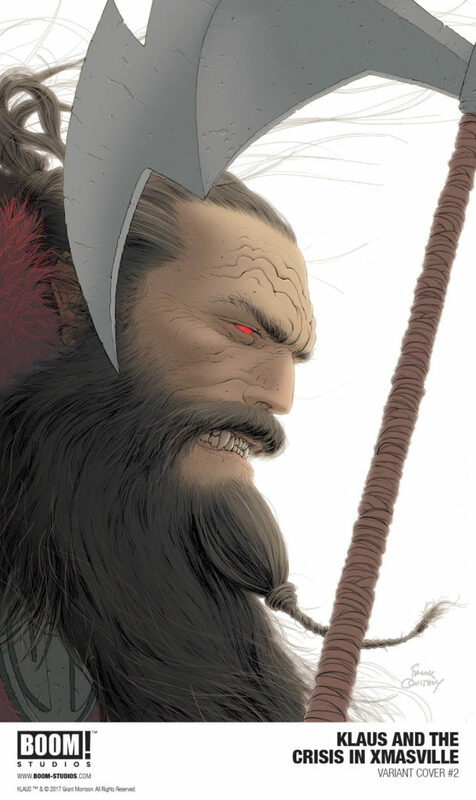 The variant cover by Quitely, a longtime collaborator with Morrison on some his most acclaimed projects, marks his debut at BOOM! Studios. Print copies of KLAUS AND THE CRISIS IN XMASVILLE will be available for sale on December 6 at local comic book shops (use comicshoplocator.com to find the one nearest you) or at the BOOM! Studios webstore. (Final orders are due from retailers by November 13.) Digital copies can be purchased from content providers like comiXology, iBooks, Google Play, and the BOOM! Studios app. KLAUS AND THE CRISIS IN XMASVILLE is the latest release from BOOM! Studios’ eponymous imprint, home to a world-class group of licensed comic book series and ambitious original series, including Mighty Morphin Power Rangers, WWE, Big Trouble in Little China, Victor LaValle’s Destroyer, Godshaper, Grass Kings, and Mech Cadet Yu. 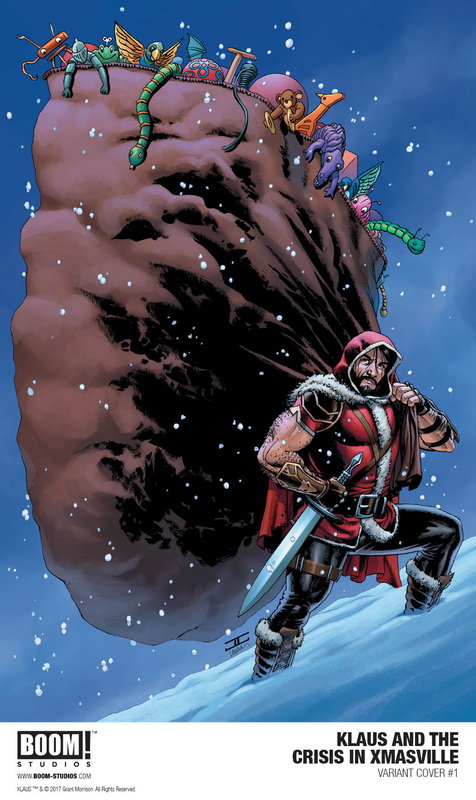 For continuing news on KLAUS AND THE CRISIS IN XMASVILLE and more from BOOM! Studios, stay tuned to www.boom-studios.com and follow @boomstudios on Twitter.